as usual, plugs in this post are unsolicited, I just link because I like these places! Rough week at work but at least there was PIE, thanks to my west side adventures on Sunday. 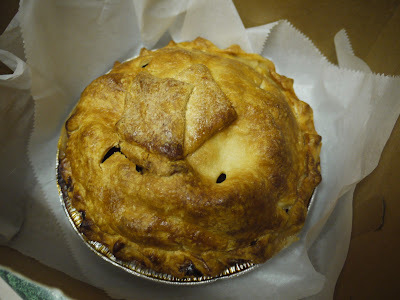 My first non-sublet apartment was near 34th street and 9th Avenue and a good friend from college lived on 43 Street and had introduced me to The Little Pie Company of the Big Apple. Living in Brooklyn and working in SoHo, I don't get north of Union Square much these days, but volunteering for the tugboat race on Sunday got me back to the old neighborhood. A bunch of us went out for drinks and a bite at the Landmark Tavern (another old favorite from when I lived in the area) and I was toying with the idea of dessert at the pub when I suddenly remembered the Little Pie Company's Manhattan Plaza location. I asked the folks who live in the area if the bakery was still at that location - locals said "Oh yes!" and Jean, one of the organizers and an old friend from my Pier 63 days, offered me a ride over there (the pub session was breaking up at this point anyways). Jean got me there 15 minutes before closing, I got the last apple pie of the day (there would have been plenty of other choices had I been too late for that, but it was a very autumnal-feeling wet and chilly day, so I was specifically craving a good basic apple pie), and have been enjoying it all week. September is one of my too-many-deadlines months at work as a number of calendar-driven projects coincide in a way that leads to a string of late nights. That's been very true this week, but at least I had pie. Good pie. Nostalgic pie, even. It helped. I will at least make sure I leave at a decent hour today, I'm finishing the last current deadline thing today. More down the road, September is one of those months for me, but once I finish this one forecast and my daily sales reports the only other must-do today is of course to VOTE. Started my day with apple pie, finishing with voting - can I get much more American than that? Yep as American as . . .
Our family are pie weirdos. Everything worth celebrating is celebrated with PIE. We even have pi(e) night every March 14. Ten kinds. Last year, Daughter #1 and I made 70. Mmmmm . . .
That's SPECTACULAR! Sounds like the Pie Night a friend and I went to at a fancy local bakery last year - only homemade, so even better! oh yeah, homemade and you don't get cut off after an hour. And you're home when you're done. Better all around!